BIGBANG 2015 WORLD TOUR [MADE] IN MALAYSIA - 80% Tickets Sold Out Within Few Hours! 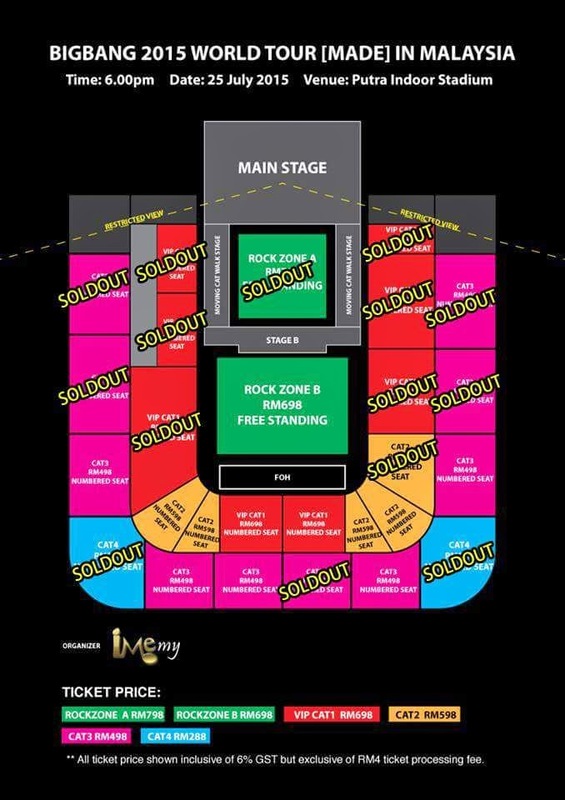 BIGBANG 2015 WORLD TOUR [MADE] IN MALAYSIA ticket launch was held successfully on 17th May at Quill Mall, few hundred of BIGBANG fans start queuing up to purchase tickets start last Sunday. Before online purchase start, around 6,000 fans hanging on TicketCharge online purchase system so they can purchase BIGBANG concert tickets on time. Concert tickets had sold out 80% on ticket launch day within few hours. Limited tickets can purchase through TicketCharge website at www.ticketcharge.com.my. Rock Zone A ,B and VIP Cat 1 tickets holder are entitled for “Sound Check Party” lucky draw. You may contact TicketCharge Hotline +603-92228811 or IME Productions +603-21666166 for ticket purchasing, or visit selected tickets outlet to purchase the tickets - TicketCharge office, IME Productions office, Speedy Music Store, Rock Corner music store, Victoria Music Center and Neway Karaoke outlet. 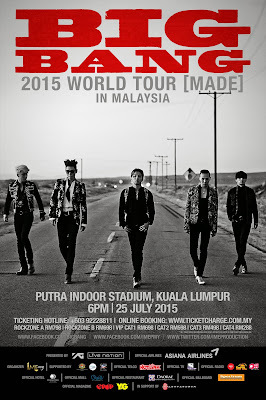 For more concert information, please visit IME Productions official Facebook or BIGBANG official Facebook.